This was our first visit to Bar Harbor, Maine and Acadia National Park. The area has three Thousand Trails – Trails Collection campgrounds. 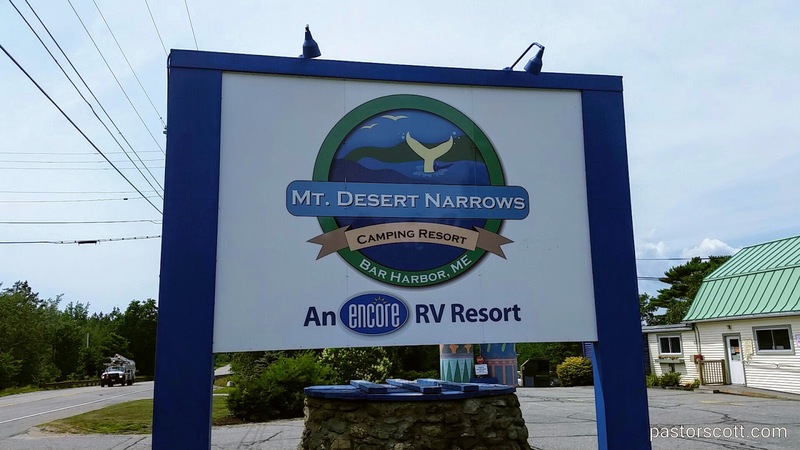 My first choice was Narrows Too because it has full hookup sites and is known for its larger campsites. From my earliest booking window it was full for the time we wanted to be there. Another option was Patten Pond which is a bit farther out from the National Park. I could have gone there, but really wanted to be able to ride the shuttle and avoid some of the traffic that makes driving anywhere sluggish in this popular tourist area. That left me with Mt Desert Narrows which is the closest to Bar Harbor. This campground has a variety of campsites, including an impressive tent camping area right on the bay. There are also back-in water/electric sites on the water but they are packed in with neighbors right on top of each other. Up away from the water there’s a large section of full hookup sites, some 30 and some 50 amp. Unfortunately for us, none of these sites were currently available to people who come in on the Trails Collection program. However, we were given a nice, grassy water/electric 50 amp “parallel parking” site near the activity center and pool. Really, no complaints. We had neighbors in front and behind us but there was room for parking, etc. Our front lawn was somewhat narrow with the road passing by. Again, no complaints. The pool is heated, making it nice even on cooler days. The staff was always friendly and helpful. We enjoyed free ice cream one afternoon and when I asked someone if my fire pit could be cleaned the fellow cheerfully stopped right then and took care of it for me. We really enjoyed having the Island Explorer Shuttle stopping right at the campground. Using the shuttles we could make connections to downtown Bar Harbor and most of the famous spots in the park. We had to drive up to the summit of Cadillac Mountain because the shuttles don’t go there. Aside from that the pickup was left parked except for a couple of trips to the grocery and for church on Sunday. The campground WiFi was decent and several sites have cable TV. We happily used their WiFi but I sat up the satellite dish so we could watch the Astros games (for some reason the local channels fail to air our Houston team, what’s up with that?). I had a weaker but usable 4G Verizon signal. I think on a future trip I would again try to get a spot at Narrows Too just to have FHU but otherwise I would return to Mt Desert Narrows, no complaints. 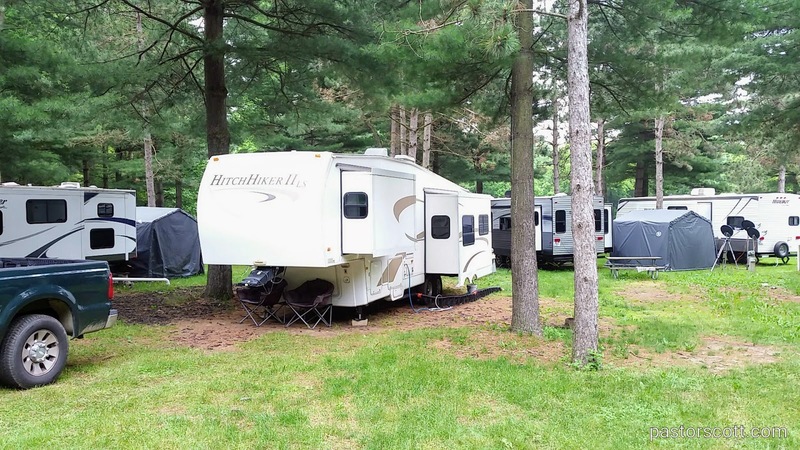 Thousand Trails offered a new add on this year called “Trails Collection.” The upgrade makes over 100 more campgrounds available to members (on a more limited basis). 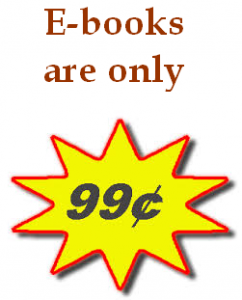 The price we paid ($199) makes it a good deal even if you intend to use it only a week or two during the year. Twin Mills Camping Resort is our first Trails Collection campground. The campground itself is an older campground with over 500 sites. Most, if not all, of the sites have electric and water. Many have full hookups. The main clientele is made up of seasonal campers. One man told me that they have been coming here seasonally over 20 years. There are many nicely done spots, with park model trailers and attractive landscaping. There are also many sites for traveling/weekend campers. Less of them are FHU, but many of them are. The campsites are in a primarily pine forest with lots of shade (and pinecones). There’s a big pool, a few playgrounds, and limited lake access. Only a very few spots actually afford lake views and they have been occupied by permanent residents for many years. Over the weekend the place was very busy. The campground, while not full, was well used and there were activities, mainly for the kids. It seemed that everyone had a campfire and at times the smoke was so thick it looked as if a heavy fog had descended on the place. Once the weekend passed the majority of the campers left and the air cleared. Our only big complaint was associated with our arrival. Unlike Thousand Trails which is (supposedly) first-come-first-served so far as campsites are concerned the Trails Collection campgrounds let you specify your site amenities, if available. At least that’s how it is supposed to work. Here’s the deal: the Trails Collection campgrounds are supposed to set aside 10 campsites for the program. When we arrived, we were told that Thousand Trails is way overbooking those 10 sites. Because of that, we were told, there weren’t any more FHU sites left out of the allocated spots. That didn’t work well for us, especially since we were in for a longer stay. The folks in the office insisted that, in spite of the many vacant FHU sites that there was nothing available to me, a lowly Trails Collection customer. I decided to phone Thousand Trails service center to see if they could help. However, while I was on hold the folks at the front desk found a few FHU sites I could pick from. We moved into a nice spot among the seasonals and settled in. From what I was told by other travelers this is not an unusual situation for this particular campground. Aside from the challenging situation upon our arrival we have no complaints about this campground. It’s a nice place in an interesting area. See the individual photos with captions here.